This is the time of year when a lot of games are selling for good prices and you may be wondering which ones are good for therapy. I have adapted Pop the Pig recently. It really only needed a communication board to add the structure I need. I use it with students who are working on making basic comments such as I have ______, and I want______. 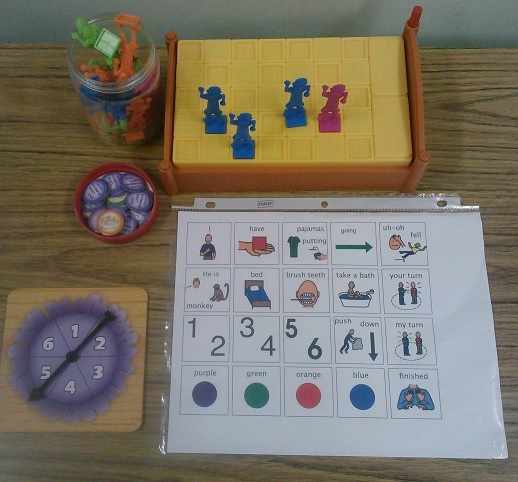 It is also possible to work on descriptive vocabulary such as size, colors and amounts. We also work on turn taking and becoming aware of another student’s turn and when they are finished. The game is really pretty simple. Students roll the die to choose a colored hamburger. 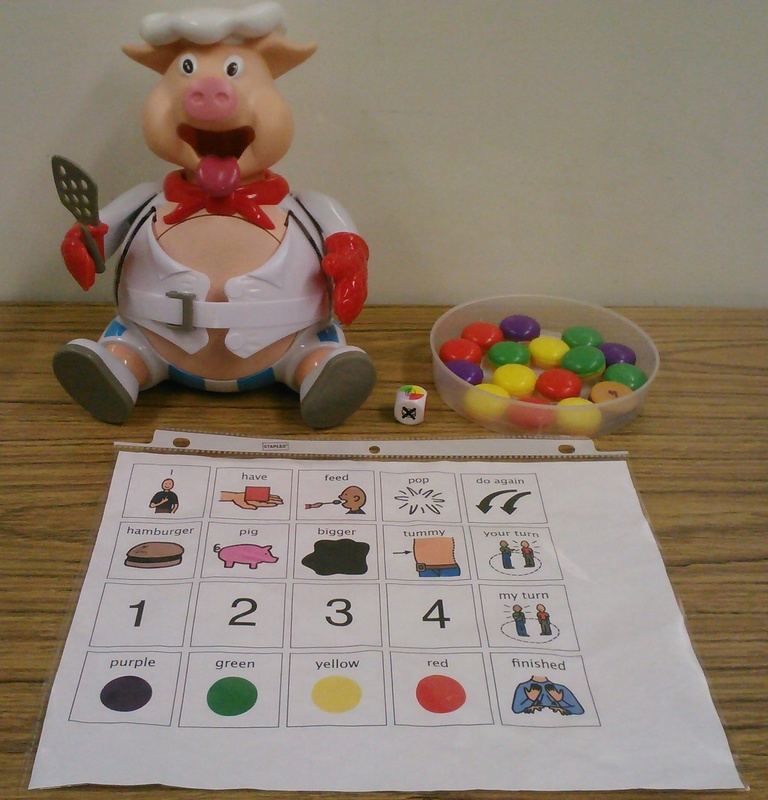 The student then looks at the bottom to see how many times they press the pig’s head so it will munch on the hamburger placed in the mouth. Pressing on the head inflates the rubber tummy until the belt pops open. It isn’t as dramatic as the advertisement indicates. However my students seem to enjoy this game and it provides a lot of repetition. I have them make comments for every turn they take. It is also good game for general reinforcement. If you find one at a good price, pick it up. Goodwill is such a good place to find cheap games to adapt for therapy. This was a recent find. This type of games works well for my students in the Life Skills program. It keeps them engaged, promotes turn taking, and teaches language with repetition. Many of my students are working on making comments using sentence frames such as I want,I have, and I need. They are also working on using descriptive words such as colors, amount and basic prepositions. 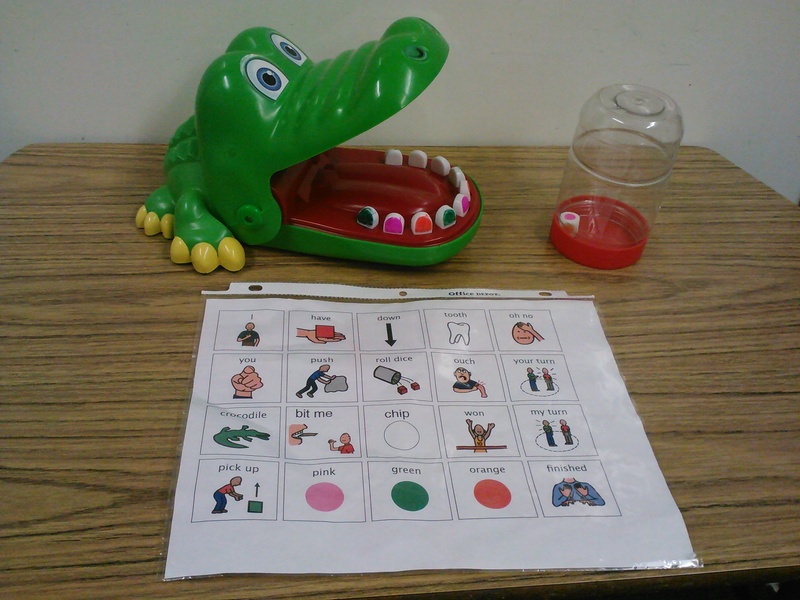 I make a communication board available for my verbally challenged students. I use the visual cues to prompt sentences. The students I worked with last year are now using the communication boards independently to form 3 word sentences. Children with autism often get stuck in an echo pattern where they answer questions by repeating the question. The communication board helps break up that pattern. This game also gives opportunity to practice verb + ing sentences. 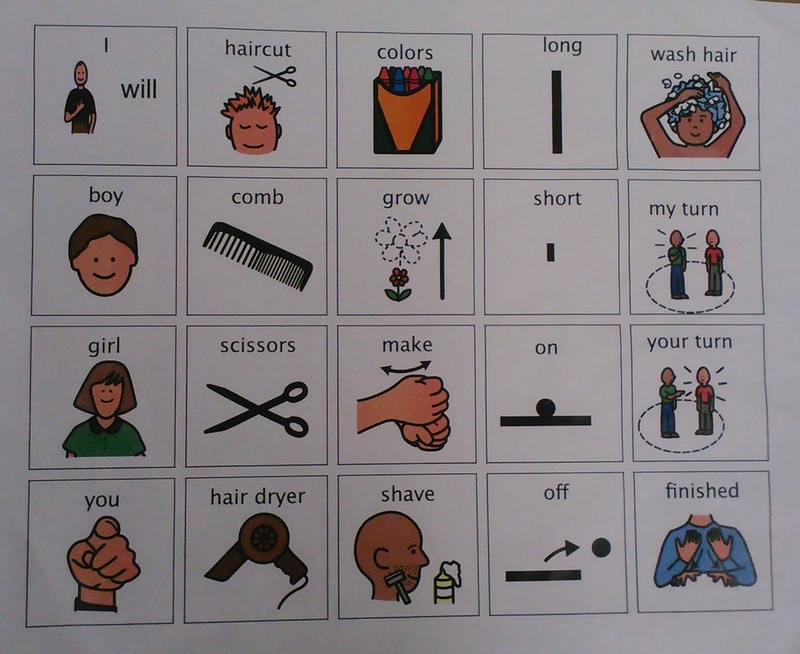 Students pick a circle card depicting a monkey getting ready for bed and use verbs such as brushing teeth, taking a bath and putting pajamas on. After describing the picture, the students put a monkey on top of the bed and then spin the spinner. The student then pushes the button on the bed post the number of times the spinner indicates. At some point the bed will spring and the monkeys will fall off. There is a game board that also comes with the game, but my students had fun using it at this basic level and I felt I had control over the pieces. I found this game had a lot of possibilities for students at different levels. I’ve thought of making more round disks to add to the variety of verbs that could be picked. Here are two adaptations for the game Crocodile Dentist. This is a plastic crocodile that has a spring loaded mouth. The mouth closes when a certain tooth is pushed down. Kids enjoy the suspense of seeing who is going to get bit. The trigger tooth changes location each time the mouth is opened. Some of you may already use this game for reinforcement. I thought you might like to know how you can expand its use a little further. I use it to expand a student’s verbal output to 2 to 3 word phrases using a communication board and to review prepositions when following directions. Using permanent markers, I colored the teeth alternating colors. I used pink, green, and orange because I already had a die that had those colors. If you don’t have a die you could make a spinner or use colors for a die you have. The colors are used in the direction cards also. Cards were made using the concept vocabulary: next to, beside, between, right, left, colors, not, side, front, either/or. Children take turns drawing the cards and following the directions for the tooth to be pushed down. We play a variation by giving each child three poker chips. They feed the crocodile a chip if he bites. The person who feeds all three chips is the winner. I provided a word program down load because I thought people may need to adjust the color words for their needs. If you have any difficulties with this, leave me a comment. Print out the cards and have the students pull them out of a bag and then follow the directions while playing the game. Winter break is finally here. December went by pretty quickly and I didn’t have time to post. Now that I have extra time I will try to catch up and tell about some of the things I have been doing. If you have a chance, pick up a package of match box cars in the after Christmas sales. It would be well worth it. They are great for therapy sessions with some of your harder more concrete thinkers. It was our last week before winter break and I needed an activity that would keep my students focused as the sugar plums danced in their heads. You may remember that last May I had a post on using match box cars. They were a very popular item especially for the boys. Just like before, I started out with descriptive work on identifying features of the vehicles and identifying a vehicle from the description. This was expanded to asking questions to get clues and drawing a conclusion in the Mystery Vehicle activity. I used communication boards to help the process. These help my lower grades as well as my more challenged learners. There is a communication board “What Vehicle is it?” in the vocabulary section. I have access to Boardmaker, but I know others do not. The boards make a big difference keeping this activity moving and on topic. 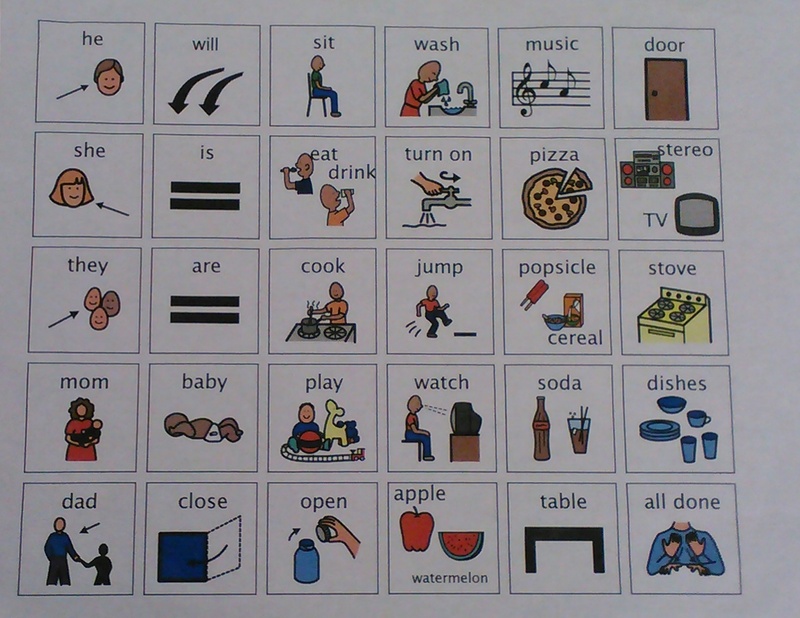 It also helps to expand the sentences of students who are trying to get past one and two word utterances. After the initial describing sessions, I decided the students could really benefit from one more round with the cars to reinforce the descriptive vocabulary. I often find the novelty is worn off by the 2nd or 3rd presentation of the same activity so I really needed to find a way to expand it. I dove into my recycle box. I found a nice long flat box. A race track seemed like a pretty good option and would be easy to put together. The race track was made by gluing black tag board on to the flat box. A piece of cardboard could be another option. I marked 3 starting positions on the top,1st, 2nd, 3rd. I could now use positional vocabulary when directing the car placement. Students placed the cars behind a paper roll. We have been working on variations of the meaning for the word “behind.” We predicted which vehicle was faster and would be first. Students took turns holding the paper roll and lifting only after “ready, set, go” was said by another student. This would also be a great opportunity to use a speech button so a nonverbal student could be included. It is a good way to practice impulse control and waiting for a verbal cue. I have found that the proper container can make a huge difference on how an activity works. A gift box from the dollar store is great for the mystery vehicle activity. Everyone likes to open presents. For the race activity, I put the vehicles in a large clear freezer bag. Some of my students have difficulty with impulse control and would be continually grabbing a vehicle if they weren’t contained in something. This way the students can see through the plastic, but are unable to grab vehicles until they have completed the work of describing and asking. The picture shows the setup. The communication board on the left was used for making descriptions and asking questions about the “Mystery Vehicle.” The communication board on the right was used to choose cars for the race and the race itself. Students gave descriptions of the vehicles they chose for the race so I was able to review those descriptions one more time.